Today, when you order "Morph by ProMystic", you'll instantly be emailed a Penguin Magic gift certificate. You can spend it on anything you like at Penguin, just like cash. Just complete your order as normal, and within seconds you'll get an email with your gift certificate. Morph by ProMystic Make a card come to life and "Morph" into their selected card. Order in the next 1 hour 37 minutes and it will ship TODAY! With the ProMystic Morph app, you can make any joker from Theory 11 (Monarchs), Ellusionist (Artifice), Blue Crown or Promystic (INCLUDED) come to life!! Simply force a card and then open the camera like app. Point the camera view at the cards and watch the card come to life with Augmented reality. You must also buy the app for $ 9.99 available for both iPhone and Android. 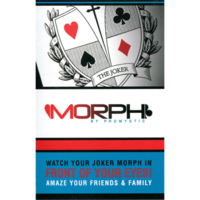 Morph comes with all the cards you need and uses an App (purchased separately) to achieve the effect. In full disclosure, the effect does work. However, as mentioned is does require the purchase of an additional phone app. That raises two questions. Why do you have to pay for the app if you purchase this? And what this this purchase get you? To answer the first question, the app does all of the work. This purchase will get you very little. It merely provides you a couple of jokers and a couple of gaffs that you probably won't need if you own of the of other available decks that this works with. This purchase doesn't even include instructions or routine ideas. So if you want to use Bicycle cards with non-standard Jokers, buy this. Otherwise go straight for the app and choose one of the other supported decks. As far as the app goes, it does work but it is very rough and so obvious that even children will know it is an app. I wouldn't say that it makes the effect worthless, but it's not nearly as hard hitting as I had hoped. It's more of a gag than a magic trick. I wish that I could take back the $18 I have invested in this trick and put it into something else. I feel quite let down. This is a great trick. People love this effect. You can go wrong with this. Grab your smartphone and perform it easy and clean. Not sure where the first reviewer is coming from. I work at functions, weddings, parties and this always blows everyone away. The fact you get it wrong and then a card freely in a camera view morphs into their card and you can move it around to a layman is mind blowing. Done this 100's of times and it has never failed to kill. Would have paid £50 for this. How many disappointments have you bought for a lot more than this even with the app. I really wanted to like this, but potential buyers should be aware that the ap doesn't work with the latest iterations of iOS or Android, and that ProMystic has no plans to update it. along with some others favourites. Apple want to much money.